Darryl Burrows, a longtime resident of Broward County, began his teaching and coaching career at Piper High School in 1981 as an assistant basketball coach under legendary coach Richard Butch Ingram. He became the head coach at Dillard High School in 1984. In nearly a quarter of a century at Dillard, he has led the boys&apos; basketball program to become one of the most successful, not only in Broward County, but in the state of Florida. His current overall record is 565 wins and 145 losses. Burrows has won 12 District titles, 10 Regional titles, and 7 State Championships, which is the most State titles earned by any Broward County school in basketball, as well as the most State titles at a single school of any basketball coach in state history. He has been selected “Boys Basketball Coach of the Year” five times and “Coach of the Year for All Sports” by the Miami Herald in 2000, and “Dairy Farmer Coach of the Year” in 2008 and 2017. Burrows is only one of two male coaches from Florida to ever coach the McDonald’s All American Games where he was head coach of the East Squad. In 2006, he traveled to Beijing where he coached at the NIKE All Asia Camp, and in 2013, he coached at the NIKE Global Challenge Games in Washington D.C. He is married to Cassandra Kearson-Burrows and has three children: Rubyne, Catoddra, and Darryl. Cliff Floyd was a three-sport star at Thornwood High School in his hometown of Illinois, where he led his baseball team to the State Championship, hitting .508 with 130 RBI during his final two years. The Montreal Expos selected him in the first round of the 1991 Major League Baseball draft, but a 1997 trade to the Florida Marlins paved the way for what would be the beginning of an All Star Career, where he helped the Marlins win the 1997 World Series. He delivered some of the best offensive numbers in franchise history over a 5-year period with the Marlins, which included an All Star Appearance in 2001 and a top 25 finish in the Most Valuable Player voting. In 2002 Floyd was traded to Montreal and later went on to Boston to close out the season. In 2003 he signed to play with the New York Mets where he hit a career high 34 home runs and helped the club to the 2006 National League Championship. In 2007 he signed with Chicago, but made his mark perhaps in the biggest way in 2008 when he signed on to play with the Tampa Bay Rays. Floyd became one of the primary reasons the Rays advanced to the World Series. He ended his 17-year career with the San Diego Padres. Since retiring, he has focused on broadcasting and philanthropy. The Cliff Floyd Foundation serves underprivileged children in South Florida. He has been a Broward County resident for 20 years and resides in Plantation with his wife Mary, and children Layla Bria and Tobias. Sally Hansell, a Cooper City resident, is best known for sincerely loving the aquatic field of sports. She moved to Florida in the ninth grade and competed in swimming and diving, each year qualifying for the state championships. She began her coaching career when she was severely injured while training for diving on a trampoline and was unable to complete. She was head diving coach at Lakewood High School and St. Petersburg Catholic High School, both in St. Petersburg, Florida. She became a resident of Broward County in 1980 and began serving as head diving coach, assistant swim coach and head water polo coach at Cooper City High School. Hansell has been the head diving coach at University School of Nova Southeastern, and has also served as director of swimming & diving programs there. She is also the head coach for the former Cooper City and present Seahawks Diving Team. Notably, she coached over 100 diving/swimming athletes to 10 top spots at the FHSAA State Championships. Seven of her divers completed their seasons undefeated in all competitions including the State Championship. Hansell serves on the Florida Gold Coast Diving Association Board of Directors as president and has been a FHSAA-certified referee for over 20 years. She has been the recipient of “Coach of the Year” in 2011 at University School of Nova Southeastern, and two-time recipient of “BCAA All Star Water Polo Coach,” and “NJCAA Swimming and Diving Coach of the Year,” as well as a selection committee member for the NISCA High School All American divers. She is married to Jim and has a son, Craig. Glenn Kaye, a long-time Broward County native and South Broward High School graduate, attended Broward Community College before matriculating to the University of South Florida, where he was a member of the first graduating class. He taught Physical Education, Health, and Earth Science, and coached at McArthur, Nova, and South Broward High Schools. While at Nova High School, his teams earned Swimming and Diving State Championships seven years, as well as five Water Polo Invitational Championships. As a swimming coach, 141 of his athletes became High School All-American Swimmers, and as a Water Polo Coach, 27 of his athletes became High School All Americans. The Florida Athletic Coaches Association inducted Glenn as “State Swimming Coach of the Year” seven times, and in 1985, the National High School Athletic Coaches Association selected him as “National Swimming Coach of the Year.” Kaye served as coach for the Trojan Swimming Club of Dublin, Ireland, in 1994-1995, where 15 of his athletes became Irish National Swimming Champions and competed successfully internationally. In 1995, the National Interscholastic Swim Coaches Association inducted Kaye into their Hall of Fame. He has been a featured speaker for the American Swim Coaches Association, the National High School Athletic Coaches Association, the Florida Athletic Coaches Association and the Irish Amateur Swim Association in Cork, Ireland. He has served as president of the National International Swimming Coaches Association. He currently resides in The Villages, Florida, where he coaches their aquatic swim team, with the accomplishment of producing 85 Master Swimmers. He and his wife Elsa have one son, Don. Kenneth Kay, a longtime Broward County resident, is originally from Michigan where he excelled in cross country and track & field, both on the high school and college levels. He began his career at Westminster Academy as a physical education teacher and head coach for cross country and track & field, later becoming program director for both sports. Over the years, his boys’ cross country teams have earned numerous honors, including Conference Champions 30-plus times, District Champs 18 times, Regional Champs 4 times, and State Champions five times. His girls’ cross country teams were also successful, earning Conference Championships 20 times, District Championships 22 times, Regional Championships three times, and State Runner-Ups three times. His boys’ track & field teams earned Conference Championships every year since 1998, District Championships 22 times, Regional Championships five times, and State Champions four times. His girls’ track and field teams have been Conference Champions every year since 1998, District Champs 20 times, Regional Champions twice, and State Champions three times. Key’s career has expanded from coaching to promoting the sports by becoming electrical timing coordinator for numerous South Florida schools. He and his wife Cathy have two adopted children, Ted and Anna. Over the years, they have opened their home to more than 40 foster children. One of the most feared defenders on a National Football League field, Jason Taylor was a four-year letterman and three-year starter at the University of Akron before being drafted by the Miami Dolphins in 1997. He became the greatest pass rusher in the storied franchise’s 52-year history and was enshrined in the Pro Football Hall of Fame in 2017. Taylor built a resume of seemingly endless athletic accomplishments: “2006 Associated Press NFL Defensive Player of the Year,” All-Pro honors on four occasions, was selected to six Pro Bowls, appeared on numerous All-NFL Defensive Teams, was named the “NFL Alumni Association’s Defensive Lineman of the Year” in consecutive seasons (2005-06) and to the NFL’s exclusive All-Decade team for the 2000s. Prior to his retirement in 2011, Taylor amassed 139.5 career sacks, ranking sixth all-time in league annals. Taylor was honored as the “Dolphins’ Most Valuable Player” on four occasions, was the club’s Leadership Award winner three times, was honored with the “2007 Walter Payton NFL Man of the Year Award,” and in 2012, was inducted into the Dolphins’ Honor Roll. He established the Jason Taylor Foundation which is dedicated to build a better future for the children of South Florida. As examples of its work, 50-plus middle-school students have been awarded college scholarships, and more than 750 deserving children have each been given a $300 back-to-school shopping opportunity at Old Navy. 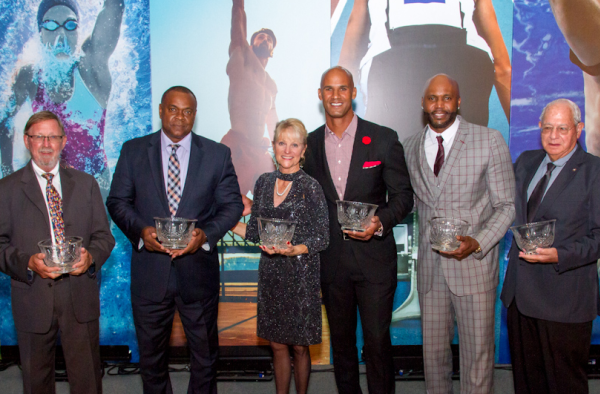 Taylor was also presented with the “Henry P. Iba Citizen Athlete Award,” given annually to America’s premier athletes who excel in their sport and have shown by their actions a desire to help others. He has three children: sons Isaiah and Mason, and daughter Zoe.